Women in Shanghai are luckier than most in China when it comes to sharing the functions of daily family life, according to a new study. A report from the Marriage and Family Studies Association found that more than 90 percent of married women in the city are satisfied with their roles in the family, largely because they have supportive husbands. "Our city's culture has been influenced by the West, which means gender parity is better here than elsewhere in China," Li Hanlin, an association official, told Shanghai Daily. She said there are more nuan nan, or considerate husbands, in Shanghai than elsewhere in China. "They respect their wives' choices, play a responsible role in the family and even do some housework," Li said. "We find that families in Shanghai are often democratic, and the status of women in society is rising." This report surveyed 509 married women, mostly aged between 22 and 60. The respondents represented a wide range of the population, including migrants and expats. 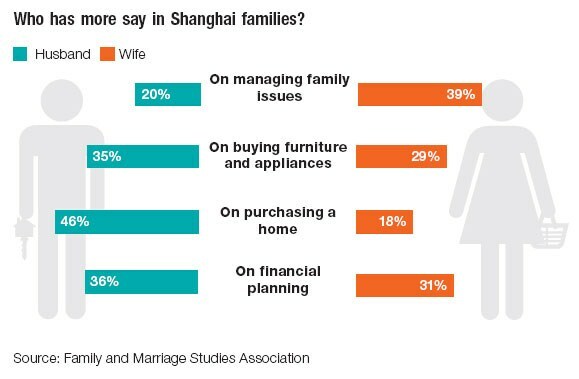 The survey found that husbands mainly handle a family's "hardware management," such as purchase of furniture and appliances, home-buying and interior decoration. Wives handle the money and other "software management" matters. "About 55 percent of respondents said they decide how much the family spends on daily living," Li said. "When couples have disputes, half of respondents said their husbands will make concessions." However, when it comes to buying things like furniture, about 35 percent of the women said they take the advice of their husbands. Another third said the decisions are mutual. When it comes to buying a house, 45 percent of women said the decision rests with their husbands. Ni Shiping, 58, mother of a 26-year-old son, told Shanghai Daily that she keeps the family's budget. "I manage most of the household affairs, such as deciding what to have for meals, what my husband and son wear, and other trivial matters," Ni said. "But for important matters, my husband, my son and I sit down and discuss things before making a decision." On their child's education, Ni said she was more active in decision-making than her husband. "I attended all the teacher-parent meetings and monitored his homework," she said. Ni said she is fortunate because her husband trusts and respects her. "I believe that she can do some things better than me," said her anonymous husband. "She is more decisive and better at communicating with others." Ni's philosophy of family life is simple: for harmony, a husband needs to share some responsibilities, while a wife is best equipped to look at the larger picture. Another wife, 54-year-old Yin Hong, agreed. "Couples need to build trust," she said, adding that she handles the family finances, but always discusses major decisions with her husband. Some couples forge harmony in different ways. Zhu Huanian, 39, said everything in her family is decided mutually. "We set up a family account to manage the household expenses and investment," she said. "For personal affairs, I handle my own expenses and he handles his. We always make critical decisions together."